The sturdy and agile German Bu 131A like the British Tiger Moth was designed with one purpose in mind, to train military pilots and in 1936 the 131B was selected as the primary trainer for the German Luftwaffe. Carl Bucker was born in 1895 in Ehrenbreitstein in Germany. After graduating from school in 1912 he joined the German Imperial Navy and later served as a deck officer on the battleship Kaiser Karl the Great. He subsequently trained as a navy pilot and during the First World War flew missions from List, Helgoland and Zeebrugge. In 1918 he met Ernst Heinkel and in 1919 retired from the military. In 1920 he went to Sweden where he worked as a pilot and later as a consultant for the Swedish Navy where during 1922 he gained Swedish citizenship and with the help of his old friend Ernest Heinkel founded Svenska Aero AB (SAAB). Employed At SAAB was a young Swede, Anders J Andersson who was closely involved in the design of the Svenska Pirate, Hawk and Jaktfalken fighter which the company produced for the Swedish Air force. In December 1932 SAAB was bankrupt and Bucker returned to his native Germany where the following year he founded Bucker Flugzeugbau GmbH with Anderson as Chief Designer. Andersson, whilst with Bucker was not only instrumental in the design of the Jungmann but also of the BU 181 Bestmann and when he later returned to Sweden and SAAB he designed the Safir which shares many of the features of and bears a close resemblance to the Bu 181. In 1934 Bucker Flugzeugbau produced its first aircraft the Bucker Bu 131 Jungmann; it was also the last biplane to be built in Germany. Designed as an ab-initio trainer as well as for aerobatics it had two tandem open cockpits, fixed landing gear with steer-able tail wheel, a steel tube fuselage covered in fabric and metal with wood and fabric swept back wings, the upper and lower wings having interchangeable ailerons for sharp roll response. The 131A had an 80 hp Hirth HM60R engine whilst the production model, the 131B which followed in 1935 was powered by a four cylinder inverted inline Hirth 5040A-2. 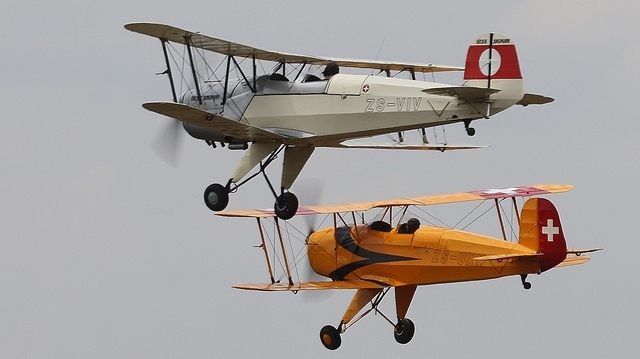 The Jungmann is not a big airplane, at 6.62 m long and 2.35 m high with a wingspan of 7.4 m and empty weight of 380kg it is smaller than the Tiger Moth and not much bigger than the Pitts S2. It has a crew of two, maximum speed of 115 mph, cruise of 110 mph, range of 390 mi and service ceiling of 13,300 ft.
At that time Germany was still restricted as far the manufacturing of weapons of war were concerned and having no official air force the Jungmann was ordered by the German Aviation Ministry for the Deutcher Luftsport-Verband, a civilian national flying club which was a front that served as a training ground for pilots for the future Luftwaffe. The Jungmann was an instant success and local orders were quickly followed by foreign interest and Bucker decided to grant manufacturing licenses to selected foreign aircraft manufacturers. The first such license was granted to the Switzerland based but German owned Dornier Werke AG and 88 were completed. In Spain a bloody civil war were raging with General Franco's Forces waging war against the Government and 100 Jungmanns' were delivered to the General's Air Force as part of Germany's support for his cause. Construcciones Aeronautics SA (CASA). A Spanish Aircraft manufacturing company was later granted a license to manufacture the Jungmann. The Spanish build version of which 530 were built was fitted with a locally designed power plant, the Tigre of 125 hp and such was the success of the little Bi-plane that it remained in production until 1960 and served with the Spanish Air Force until 1968 after which numerous examples found their way into the civilian market. Local versions of the Jungmann powered by a 100 hp Hitachi engine were also produced under license in Japan and 1,037 were delivered to the Japanese Army and 339 to the Navy. In Czechoslovakia the Tatra Wagon factory were granted permission to built ten examples but no order were received from the government until 1946, after the war, when 260 were ordered. A further 315 were exported to Hungary and 400 to Bulagaria. Orders for 19 aircraft for civilian use were also received from South Africa. In 1994 production of the Bu 131 was briefly restored as the BP 131 using the original jigs by Bucker Prado in Poland. Twenty one aircraft fitted with a Walter engine were produced. The South African Jungmanns' were impressed by the Government during World War II and none are reported to have survived. The only German built Bu 131 in South Africa is ZU-BUC, construction number 20. 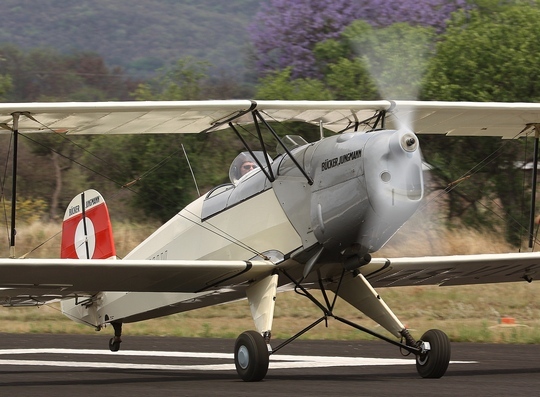 The oldest Jungmann in existence belongs to Brian Zeederburg and is based at Syferfontein, Baragwaneth. Brian's Jungmann was build at Bucker's Rangdorf factory in Germany and was delivered to the Swiss Aero Club in 1935 were it remained until 1963 when it was exported to the UK before finding its way to South Africa. 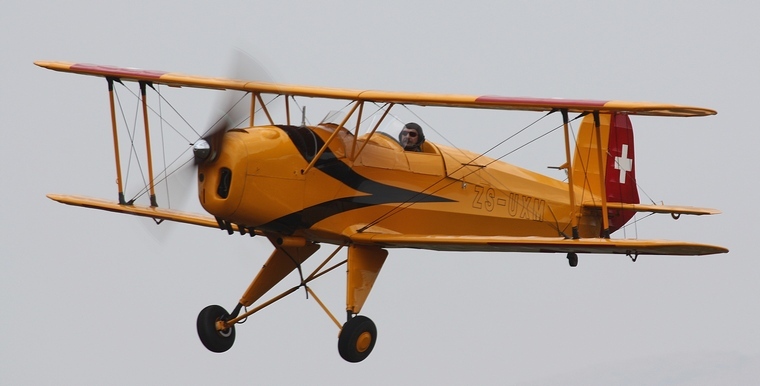 Following on to the success of Albert Reusch who in 1963 won the Swiss National Aerobatics competition in his nearly thirty year old design but then powered by the 180 hp IO-360 Lycoming Brian's Jungmann received a similar transplant. The original Hirth has not been lost though but together with the firewall and engine bearers is safely stored. Close to 200 of Anders Andersson's designs still fly today, most of them are Spanish build Casa 1.131s' and two of these were brought to South Africa during 1984 by the late Peter Hengst. One of the Polish build example powered by a 180 hp Wather engine, construction number T-131.129, was imported and registered on the 1 Feb 2008 as ZU-EWE and is based at Tedderfield. Such is the success of Anderson's design that more than 4,000 Jungmann's were build world wide and that as late as 1970 Eric Muller was placed 35th in a Aerobatics Competition in Hullavington in England.